Branco Milanovic is the former chief economist at the World Bank, where he became recognised as the expert on global inequality of incomes. After leaving the bank, Milanovic wrote a definitive study on global inequality which was updated in a later paper in 2013 and finally came out as a book last year, Global Inequality. 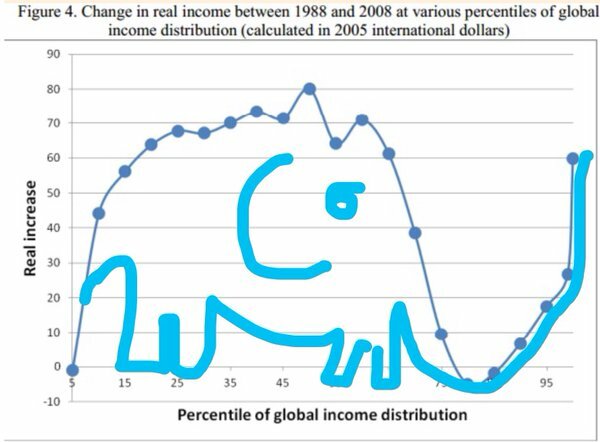 In his earlier papers and in the new book, Milanovic presented his now famous ‘Elephant chart’ (shaped like an elephant) of the changes in household incomes since 1988 from the poorest to the richest globally. Milanovic shows that the middle half of the global income distribution has gained 60-70% in real income since 1988 while those nearer the top group have gained nothing. Milanovic found that the 60m or so people who constitute the world’s top 1% of income ‘earners’ have seen their incomes rise by 60% since 1988. About half of these are the richest 12% of Americans. The rest of the top 1% is made up by the top 3-6% of Britons, Japanese, French and German, and the top 1% of several other countries, including Russia, Brazil and South Africa. These people include the world capitalist class – the owners and controllers of the capitalist system and the strategists and policy makers of imperialism. But Milanovic found that those who have gained income even more in the last 20 years are the ones in the ‘global middle’. These people are not capitalists. These are mainly people in India and China, formerly peasants or rural workers have migrated to the cities to work in the sweat shops and factories of globalisation: their real incomes have jumped from a very low base, even if their conditions and rights have not. The biggest losers are the very poorest (mainly in African rural farmers) who have gained nothing in 20 years. The other losers appear to be some of the ‘better off’ globally. But this is in a global context, remember. These ‘better off’ are in fact mainly working class people in the former ‘Communist’ countries of Eastern Europe whose living standards were slashed with the return of capitalism in the 1990s and the broad working class in the advanced capitalist economies whose real wages have stagnated in the past 20 years. There are many controversial points in Milanovic’s work that I have outlined in previous posts, but a new controversy has arisen now. The British think-tank Resolution Foundation has analysed the Elephant chart. The Resolution Foundation found that faster population growth in countries like China and India distort the conclusion that it was the lower classes of the advanced capitalist economies that had no income gains since 1988. Indeed, if we assume for the moment that incomes were unchanged in every country, then the population effect alone would lead to apparent drops of 25 per cent in parts of the global income scale associated with poorer people in rich countries. A revised graph that removes the effect of different population growth would show that the lower income groups in the advanced capitalist economies did see real incomes rise since the late 1980s – although nowhere near as much as the top 5-10% of income earners. This result has led the likes of the Financial Times and other supporters of global capitalism to argue that rising inequality has not been due to ‘globalisation’ (the shifting of capital and investment in manufacturing and industry into ‘emerging economies’ at the expense of the industrial proletariat of the ‘North’). This is a comforting conclusion for the apologists of capital at a time when populist anti-capitalist sentiment is rising and is attacking the idea of ‘free trade’ and ‘free movement of capital’, thus threatening the profitability of capital globally. But the Resolution Foundation’s analysis does not do away with the incontrovertible fact that inequality of incomes and wealth has increased since the early 1980s in virtually every country. Milanovic’s own work shows that inequality of income (and wealth) within the imperialist countries has risen in the last 30 years and is now as high, if not higher, than in 1870. As Toby N points out, what the Resolution Foundation finds is that a large section of Western lower middle and working classes experienced a cumulative real income growth of c25% (with Japanese lower income deciles experiencing contraction, US lower income deciles experiencing low but positive growth, and Western European lower deciles experiencing c45% cumulative income growth). But these levels of cumulative income growth have been lower than the income growth at the top of each of the income distributions for the respective developed market blocs (leading in many developed countries to higher levels of income inequality), and lower than the income growth of the global median or global poor (leading to lower levels of income inequality across the globe, principally due to the rise of China). And, as I have pointed out before in previous posts, the management consultants, McKinsey found that in 2014, between 65 and 70 percent of households in 25 advanced economies were in income segments whose real market incomes—from wages and capital—were flat or below where they had been in 2005 (Poorer Than Their parents? Flat or Falling Incomes in Advanced Economies. This does not mean that individual households’ wages necessarily went down but that households earned the same as or less than similar households had earned in 2005 on average. In the preceding years, between 1993 and 2005, this flat or falling phenomenon was rare, with less than 2 percent of households not advancing. In absolute numbers, while fewer than ten million people were affected in the 1993-2005 period, that figure exploded to between 540 million and 580 million people in 2005-14. For example, 81 percent of the US population were in groups with flat or falling market income. However, according to the latest report by the US Census Bureau, Americans last year (2015) reaped the largest annual gain in nearly a generation as poverty fell, health insurance coverage spread and incomes rose sharply for households on every rung of the economic ladder, ending years of stagnation. The median household’s income in 2015 was $56,500, up 5.2 percent from the previous year — the largest single-year increase since record-keeping began in 1967. The share of Americans living in poverty also posted the sharpest decline in decades. The average incomes of the poorest fifth of the population increased 6.6 percent after three consecutive years of decline. And the official poverty rate declined to 13.5 percent from 14.8 percent in 2014, the sharpest decline since the late 1960s. But beneath these headline figures, the story is not so sanguine. The numbers still offer a lopsided picture, with a gargantuan share of income rising to the top. While the bottom fifth of households increased their share of the nation’s income, by the census’s definition, to 3.4 percent from 3.3 percent, the richest 5 percent kept 21.8 percent of the pie, the same as in 2014. And incomes in the middle, measured in 2015 dollars, were still 1.6 percent below the previous peak of $57,423 a household, which was attained in 2007, just before the economy sank into what has come to be known as the Great Recession. Today, US median household incomes are still 2.4 percent below the absolute peak they hit in 1999 just before the dot.com bust and global financial crash. Indeed, according to Elise Gould of the Economic Policy Institute, the income of American households in the middle of the distribution last year was still 4.6 percent below its level in 2007 and 5.4 percent below where it was in 1999. Men’s earnings from work increased 1.5 percent. But they are still lower than in the 1970s! Households at the 10th percentile — those poorer than 90 percent of the population — are still a bit poorer than they were in 1989. Across the entire bottom 60 percent of the distribution, households are taking home a smaller slice of the pie than they did in the 1960s and 1970s. The 3.4 percent of income that households in the bottom fifth took home last year was less than the 5.8 percent they had in 1974. By contrast, households in the top 5 percent have profited nicely from America’s expansions. In 2015, they took in $350,870, on average. That is 4.9 percent more than in 1999 and 37.5 percent more than in 1989! Sure in 2015, the US poverty rate dropped by 1.2%. However, there are still 43.1 million people living in poverty in the US, up from 38 million in 2007. The poverty rate has hardly budged since the 1980s. So let’s sum up; what does all the analysis of global and national inequality tell us? First, that global inequality has increased since the early 1980s, when ‘globalisation’ got moving. 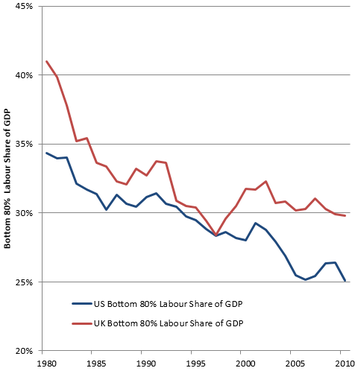 Second, that global growth of incomes has been concentrated in China, and to a lesser extent and more recently, India. Otherwise average global household income growth would have been much lower. 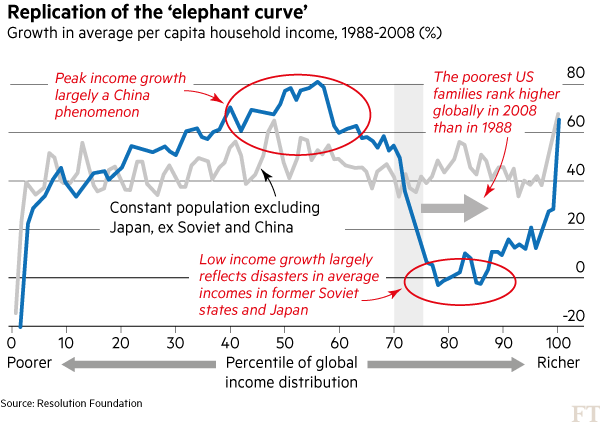 Third, there has been a rise in average household incomes in the major advanced capitalist economies since the 1980s, but the growth has been much less than in China or India (starting from way further down the income levels) and much less than the top 1-5% have gained. Fourth, since the beginning of the millennium, most households in the top capitalist economies have seen their incomes from work or interest on savings stagnate and must rely on transfers and benefits to improve their lot. These outcomes are down partly to globalisation by multinational capital taking factories and jobs into what used to be called the Third World; and partly due to neo-liberal policies in the advanced economies (i.e. reducing trade union power and labour rights; casualization of labour and holding down wages; privatisation and a reduction in public services, pensions and social benefits). And it is also down to regular and recurrent collapses or slumps in capitalist production, which lead to a loss of household incomes for the majority that can never be restored in any ‘recovery’, particularly since 2009. In other words, rising inequality is the result the drive of capital to reduce labour’s share and raise profits and to the recurrent and periodic failures of capitalist production. That is something that the likes of FT and mainstream economics wishes to ignore. This entry was posted on September 14, 2016 at 6:33 pm and is filed under capitalism, economics, Profitability. You can follow any responses to this entry through the RSS 2.0 feed. You can leave a response, or trackback from your own site. Dear Michael, I think, if one does not fall into the reductionist analysis by talking about one aspect of “globalisation”, should take on ‘globalisation” and its consequences as a whole: “the emerging economies, wars, privatisation, the environment, waste, etc. All this, and other aspects, are generally ignored by the defenders of the system or taken in isolation. Thus they generally look for something here or there to blurr the picture and justify the system. India just had its largest strike. This is a signal general median income there indeed rose in these last few years, since it’s when wages rise that, generally speaking, the working class is the strongest. The loss of industrial and manufacturing jobs in China mean these figures are already dated. Like the US thirty years ago, the move to a service based economy means pay cuts for tens of millions of Chinese workers. Retail sales in the US tell their own story. As predicted they fell. Now that the top 20% are cutting back on their spending because of jittery markets, inequality will come home to roost, as it is this quintile that is responsible for the lion’s share of consumer spending. Here we go. What’s interesting politically in the US (as in the UK, I think, has been the radicalization (to the right and left) of young people from ‘middle income families” of the right and the left. The reasons are obvious: they are forced to buy health insurance they can’t afford, so many go without health insurance. The cannot afford to go even into state colleges and universities ,because education has, in essence, been privatized (colonized by the law of value and corporations), ever having one’s own home is out of the question, and fictitiously maintained real estate values make even a decent apartment beyond their means. There is fierce competition for scholarships and classes for certain jobs decent pay jobs (medical, IT, etc.). The data we have to work with is weighted with bs. It’s a shame we haven’t marxian thing tanks, etc. for good economic data….We depend on the bourgeoisie for everything! (the poorest on the left, the richest on the right). ALL COUNTRIES have their poor people. Capitalism does not finish with poorness. Maybe I am getting lost in the numbers here, but it sounds like capitalism actually is still delivering on its promises, saving a lot of people worldwide from miserable poverty. It is interesting though that so many seem to feel this is not the case. I would have thought inequality would have been a dead end politically as long as all boats were being raised. Maybe that’s not the case. As if poverty is just a natural thing that capitalism acts upon? Capitalism creates poverty all the time. As for inequality being meaningless in a society were incomes are rising, do you think people stop noticing gross iniquities just because there’s a few more bucks in their paycheck? Which may very well be sucked away by rent increases etc. I don’t want to get in to what is or isn’t natural, but wouldn’t you say poverty was essentially the default condition of nearly all of humanity over our whole existence? And even though capitalism creates poverty, like I said, it sounds like these numbers are saying that on balance more are being rescued from poverty than condemned to it by capitalism. But I don’t know. It seems like this recent period where only like 3/4ths of the world is in miserable poverty is not only a small portion of total human time, but also a pretty small portion of the total life span of capitalism. So I find it difficult to know what to make of it. How real and sustainable is this recent growth in global wealth? Are we still being propelled forward by the afterglow so to speak of the great post war economic boom? The data is unmistakable: if you take out China (which is not a capitalist country), the number of poor people, relatively and absolutely, rose since 1980. Nevetheless, you’re confusing two completely different things: one thing is the concept of poverty; another thing is the level of development of the productive forces. The first is the relation any member of any society receives in wealth said society produces and the total wealth said society produces; the other is simply the total wealth any given society produces any point of time of its existence. To state poverty is natural is absurd by definition, because poverty is, by definition, a subjective (social) concept. It would be preposterous to state a pharaoh of the Ancient Egypt was poor because he didn’t enjoy, for example, electricity or antibiotics. He was of the dominant class, therefore he was rich by Ancient Egypt standards. Another thing is the official definition of poverty used by bourgeois institutions: every country has its own threshold that separates the poor from the not-poor; every international institution (e.g. UN, WB etc.) has its concept of poverty. Those are even more subjective. Being only considered extremely poor in 1990 if you lived with less than $1.00 per month means nothing in 2016. Thank you very much for your reply, Virgens. In your reply we seem to be defining away our ability to compare the lot of an average person in one production ecosystem to the lot of an average person in another. But if we cannot really decide whether capitalism is an improvement on what came before, with respect to the quality of life experienced by the average person, then how could we know if socialism is an improvement in just such a way over capitalism? Sure, it would be silly to call a pharoh poor, but isn’t it also a bit silly to fail to observe that a fairly poor person in say Detroit probably has a higher life expectancy than your average pharoh did? “Poverty” is a social term, not an anthropological one. It’s only useful in describing those left in destitution by capitalism’s law of value. In that sense capitalism has created poverty! just as it has created unemployment! Capitalism brings out the creativity in man! In the early 19th century, David Ricardo proposed a wage basket for one wage earner which would satisfy the needs of a family of four. Capitalism has yet to achieve this El Dorado, even during the Keynesian war boom, which, alas, has ended. Only 90,000,000 people were killed in WW2! Maybe there is hope for bigger numbers in WW 3! … as there is hope in the Gavolt’s factoid that only “3/4 of the world is in miserable poverty…” –!00 percent of neanderthals lived in poverty! Yea for capitalism! Gavolt, you’re another Swift.